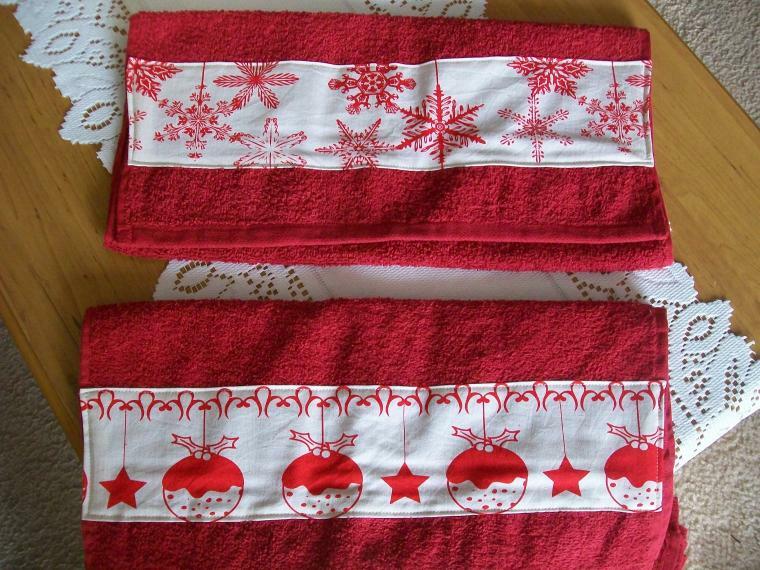 ​Here's the hand towels I made and the instructions from decorating face washers the same way. Fancy face washers make lovely presents for females of any age. My Grandma gave me face washers and hand towels with crocheted edges for birthday presents when I was little. They were beautiful and I loved them. It was twenty years before I was able to unpack them for use in my own home. Every time I used them I thought of my Grandma. 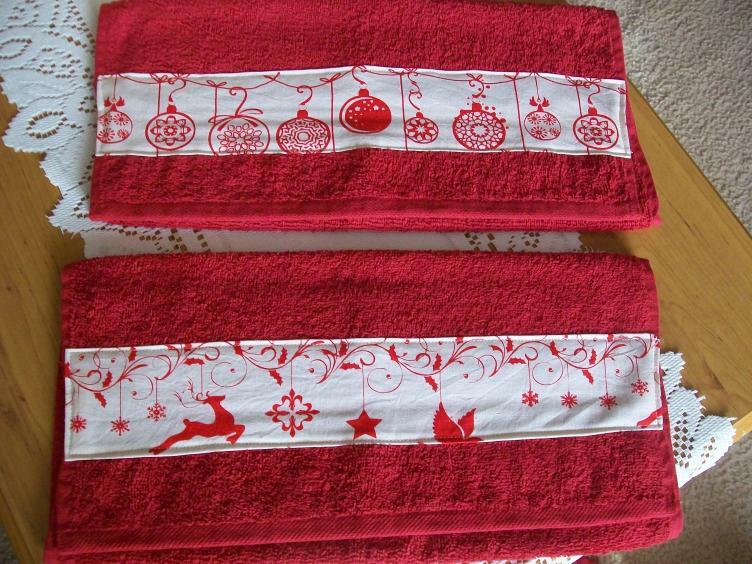 * Scraps of material about 10 cm wide x the length of the face washer or hand towel. * New face washers or hand towels. Cut the material strip to the desired width and length allowing an extra centimetre for a seam around all the edges. Fold and iron the one centimetre allowance back onto the wrong side of the material. Sew the material onto the right side of the face washer. Quite often face washers have a strip of detail woven across. I cover this with the material. Trim all cottons and there you have it, a lovely present that cost $1 - $2. My girls have requested one in their Christmas stocking. These are a lovely gift for a new mum, and yes, they get their name from the mythical baby bundles left by the stork. They are easy to make, taking only a few minutes and look really cute when you hand them over. Best of all they are inexpensive and anyone, no matter how creative, can whip one up in just a few minutes. You will need: 10 new born disposable nappies 10 rubber bands a length of ribbon one bunny rug Step 1. Roll each nappy like a Swiss roll and secure with a rubber band. Step 2. To assemble the bundle, fold the bunny rug in half lengthwise and then in half again, creating a long strip. Lay the folded blanket in front of you and stack four rolled nappies in the centre. Step 3. Stack three nappies on top of the first four, then two nappies, and then one on the top. Step 4. Fold the ends of the blanket up to help hold the nappies in place. Make sure the top of the bunny rug is even on both sides. Step 5. Tie the ends of the blanket together with a ribbon, attaching a teething ring or dummy to the ribbon. The instructions are for a stork bundle made with disposable nappies, which, despite their environmental issues, will make life easier for the new mother in those first few days before she gets into a routine - please don't point the cost, dollar, environmental or otherwise out to me before you finish reading. But stork bundles can be made up with anything that will roll. I've made them with cloth nappies and face washers, and even a bundle of flannelette bunny rugs with great success. A bundle of MCNs would make a lovely and very useful gift too. You could use bibs, jumpsuits, singlets - anything at all that will roll up. Use your imagination! All these things are very handy with newborns, and you can never have too many nappies, face washers or bunny rugs as they all have so many uses. I like to sew (patchwork etc.) and keep all my offcuts. 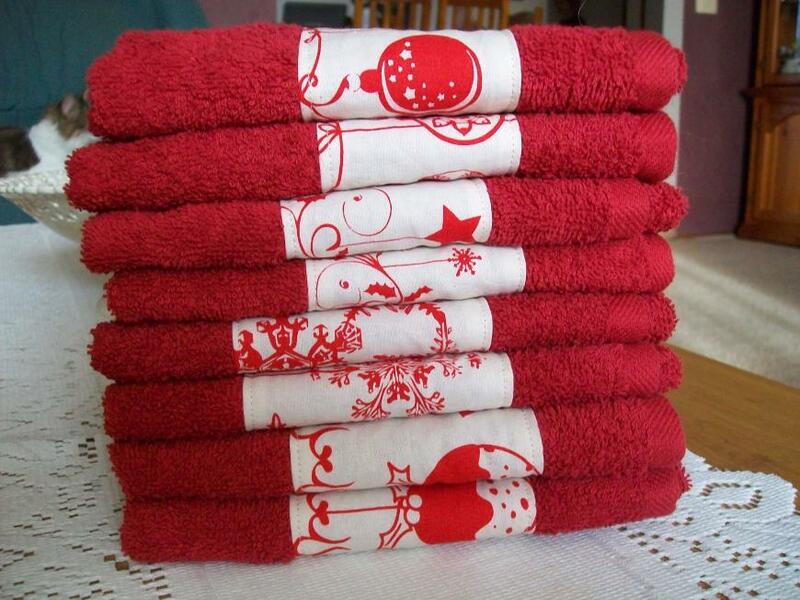 These come in useful to applique children's printed cotton fabrics as a border onto towels and face washers. Always keep an eye out for plain white towels on special/embay etc. and you can make a really lovely set for under $12. I never pay more than $10 max for a good quality towel, and no more than $2 for quality washer. In addition I often crochet around the washer as well. This makes a lovely gift for baby, or family. Tea towels can also be embellished this way too, often picked up for $2 - $3 each. A cheap track suit top can also be dressed up this way for little cost and effort. If only small offcuts are available press them into blocks by folding over raw edges and sew in place as variety of tumbling blocks. You are only limited by your imagination. ​ My best friend's birthday came up at a very financially strapped moment. After much brain wracking I came up with a gift that she's still talking about months later - a personalised cake. With basic cake making materials I had in the house and a bag of two of candy I made a cake in the shape of her final year honours project (a weird prehistoric worm). The beauty of this gift is that even if it's not quite a success, odds are the recipient will know what design you were going for (lopsided melty Dalek anyone?) and it will taste good. The internet has many images and examples to help you along. Just use a favourite, faithful cake recipe and have a go. My friend was burned out and lost everything in the Ash Wednesday fires 1983. One of her ongoing anguishes was that she had lost "her past". All mementos and photographs were burned. If you know someone who has lost everything, then at some point in the future - weeks or months away, it doesn't matter - go through your albums and make duplicates of every photo you have involving your friend and their family, and give these to them. You may be able to organize duplicate swimming certificates, sporting trophies, class photos etc. for their children. Speak to others at school, kinder, the tennis club or wherever there may be people who can help re-construct a "lost past". It really helps. This idea is great for gifts. I asked all my parents friends for photos over the years of them for their 40th Wedding Anniversary and put it together in an album. It meant more to them than anything I could've purchased. ​A Birthday IOU - Fantastic! As my Birthday is so close to Christmas I sometimes get less than thoughtful gifts. This year from a very dear friend I got something that just blew me away. We are both busy people with fly in, fly out lifestyles and businesses to run so I was so happy to receive my birthday gift of an IOU Lunch inside a handmade card! I can't wait to use it as we sometimes have quite a few months go by before we manage to catch up. ​One $18 Investment Saves Hundreds on Wedding Invitations AND Gifts! I purchased invitation software to make my own wedding invitations, place cards etc - at a total cost of $18 - I'm saving a fortune on the invitations by doing them myself, and have also started to find other uses for the software - instead of filling out event information - I have filled it out using our household's prized sticky date recipe and presented it just as I would an invitation by printing on fancy card and adding embellishments. They look stunning, and I know that they will be treasured by those who have received them as they ask us every time we visit to make the sticky date pudding! A little gift with a lot of thought. I'm going to do the same with my cookie recipe and hand out to my workmates with some samples of the completed version wrapped in cellophane. In the next couple of weeks my family have a couple of kids birthdays coming up. We budget for $50 each birthday in our family. Realising how much we had to spend in the upcoming weeks we decided to put some more thought into each gift. I went down to a discount store and bought a mixture of pens, pencils, crayons, water paints, chalk, bubbles, etc. All up this adventure cost me $15. I then Googled 'kids colouring pages' and made each child a colouring book appropriate to their age and trend and made a very beautiful black and white front cover with their names on them. I put each gift into a re-gifted gift bag. They look fantastic and full and will provide hours of entertainment. Not only have I saved over $35 per birthday I have made them something that I know they will like and I am prepared for birthdays in advance!! It saves me running out last minute and picking up a toy that they may have or wont like or use! I can guarantee that these will be used. My family has 9 birthdays in the month of August so instead of buying so many cards at around five dollars each my daughter and I have been creating our own cards from coloured paper and glitter pens that we pick up from Spotlight and the local supermarket. Not only does it give me quality time with my daughter it's great fun and you can be as creative as you want .... I save around $45 just in that month. Instead of going out and buying all those presents for birthdays, engagements, weddings, etc., why don't you make them instead? You are able to create many items to suit each person as an individual, and it cuts out the hours of shopping. You can make a paperweight out of a smooth rock for a writer; a tie-rack for your dad; vases for Mum; the list is endless. You can buy craft books from Spotlight for around $10 to $20, and that will see you through many years. I have found, myself, that this is a lot cheaper than buying things for presents. Early in the year I make a list of people who need presents at Christmas and divide into groups (usually the men and the women). Then I buy things in bulk throughout the year, enough for each basket and by December have a lovely lot of gifts that look expensive but aren't. For example, for the women, soap can be bought in packets of 6 or 8 for between $2 and $5, bath gift sets ($5-$15) can be divided up and one can receive the bath salts, another the oil etc, and hair clips/ties can be divided between the younger girls. For guys, disposable razors, chocolate, socks, movie tickets, etc can be great gifts and usually can be bought in bulk. Doing it this way means each gift can be personalized if necessary, but by buying the majority of its components in bulk it will still work out much cheaper than buying individual gifts. Here's a great idea for cheap but great gifts for grandma. All you need is a cheap calico/cotton apron (pick them up in a dollar shop or spotlight) and some fabric paints. Pour the fabric paint out onto a paper plate. Draw three stems along the bottom of the apron and get the kids to dip their hands into the paint and make hand prints at the top of the stems. They'll need to make 3 or 4 prints, moving their hands around each time to make a flower effect. Leave the paint to dry and 24 hrs later iron on reverse to make the paint stay. for best results don't wash for at least a week. Voila! An original and special gift for any one who likes to cook. Another idea is to put loads of random footprints all over the apron and scrawl something like 'my grandkids walk all over me' across the front. 1. Make a sachet from a small piece of fabric with a simple ribbon tie. Fill it with any of the following: rose petals, cotton balls with vanilla powder, cinnamon sticks with orange peels and cloves, lemon thyme and lemon verbena leaves or lavender flowers. 2. Bake your gifts. Some of my favorite gifts from the kitchen are spiced nuts or orange-chocolate truffles. 3. Make a gift basket with a theme such as pasta. Include in the basket a wooden slotted spoon, a small bottle of olive oil, some herbs, and maybe a recipe card or two. 4. Give a movie pass and a bag of special popcorn kernels. 5. Make flavored coffee mixes, soup mixes, layered cookie mixes, or other similar ideas and put in pretty jars (found at craft stores). Attach, using some ribbon, a card with mixing instructions.